In a world where everyone carries a cell phone and some carry more than one, it is surprising that people still check the historic clocks on the Capitol campus for the time of day. On a weekly basis, Library Buildings and Grounds Electrician Eugene (Geno) Blowe winds the magnificent clock above the west door in the Main Reading Room of the Library of Congress Thomas Jefferson Building, known as Mr. Flanagan's clock for the man who created it. First thing on Monday mornings, he winds the clock with a key. The winding and setting mechanisms are located in the back of the clock, which Blowe reaches by taking an elevator to a locked alcove overlooking the Reading Room that houses the clock. Library Buildings and Grounds Electrician Geno Blowe sets the Flanagan clock. Before winding and resetting the clock, Blowe carefully checks the time of day on his cell phone. "If the clock is even a few minutes off, we get complaints from people in the Reading Room right away," Blowe says, noting that the clock loses about five minutes a week. "Even with their laptops and cell phones and watches, they still go by the Flanagan clock." Sculpted by John Flanagan in 1896, this grand clock in the Library's Main Reading Room is topped by a life-size bronze statue of Father Time with his scythe. He is encircled by a mosaic of zodiac signs and three-dimensional statues of women and children representing the seasons. Two young male readers lean against either side of the clock. The Architect of the Capitol is responsible for the maintenance of most of the clocks on Capitol Hill. It's a big job. According to Electronic Mechanic Supervisor John Bean from the Electronic Engineering Division, on the House side of the campus there are approximately 4,000 clocks, and there are close to that number in the Senate. Each Congressional office suite has at least three clocks, including wall clocks and mantle clocks in the members' personal offices. A number of historic and sculptural clocks are cared for by the AOC, Senate and House Curators. Approximately 20 AOC Electronic Mechanics from the Electronic Engineering Division are trained to work on the clocks. This division is responsible for clocks across the campus, as well as cable television, fiber optic cable transmissions and other electronic equipment, including audio set-ups for special events. Like Blowe, Electronic Mechanic Valerie Williams winds historic clocks in the Capitol on Monday mornings. "Maintaining and working on the clocks is definitely different from anything I've ever done in my career," says Williams, who has worked at the AOC for 20 years. Williams winds the Car of History clock in National Statuary Hall from the back, which she accesses by climbing a narrow staircase to what was once the visitor gallery in the former House Chamber. If the hands on the front of the clock need to be re-set, however, Williams accesses the front of the clock with a ladder. AOC Electronic Mechanic Valerie Williams winds the Car of History from the back. The Car of History is one of the best-known clocks in the Capitol. The second Architect of the Capitol, Benjamin Henry Latrobe, first sketched the clock that he wanted to be placed over the north door of the Hall of the House of Representatives, opposite the Speaker's desk. He drew a female figure seated in a chariot. The wheel of her chariot became the clock by which the members told time. Latrobe had Italian sculptor Carlo Franzoni make the model for the clock and carve it in marble. Latrobe's design was changed to depict what we see today. A standing female figure, Clio, the muse of history, is clothed in heavy classical Greek or Roman garments. In her left arm, she holds a book while looking in the opposite direction. With her right hand, she is writing or pointing to her notes. Installed in 1837, the clock's works are by Simon Willard, who some consider America's most well-known clockmaker of the period. Although the meeting place for the House of Representatives moved in 1857, the clock still faces an entrance to the House Chamber. The Car of History adds beauty and grace to National Statuary Hall. According to Architect of the Capitol Curator Barbara Wolanin, who considers the Car of History one of the most beautiful and graceful sculptures in the Capitol, Clio is recording in her book what the members of the House of Representatives are doing as they make history. The more modern clocks at the Capitol do more than just tell time. Their lights and buzzers help members of Congress monitor floor activities in their respective chambers. There's always been a need to inform members of votes and other actions in the chambers. It's been said that before the House and Senate office buildings were built, a man with a bell walked the hallways of the Capitol announcing votes. On July 24, 1888, the House approved a resolution to add legislative signal bells to the House wing of the Capitol to keep members informed of House floor proceedings. When the first office buildings opened – the Cannon House Office Building in 1908 and the Russell Senate Office Building in 1909 – signal bells were installed to alert members to quorum calls and pending votes. Click on the graphic above to enlarge the chart. According to Bean, electric clocks were installed throughout the campus in the 1960s. They had several functions – lights and buzzers indicating floor activity and keeping correct time. That system worked for about 40 years until high-frequency transmissions started interfering with and degrading the Capitol's signals, thus disrupting service. Bean, who has worked for the Architect of the Capitol since 1978, says that was when the AOC decided to build a wireless system to operate the clocks. The new system was built parallel to the old so there would be no disruption in service to members who had come to rely on the clocks. 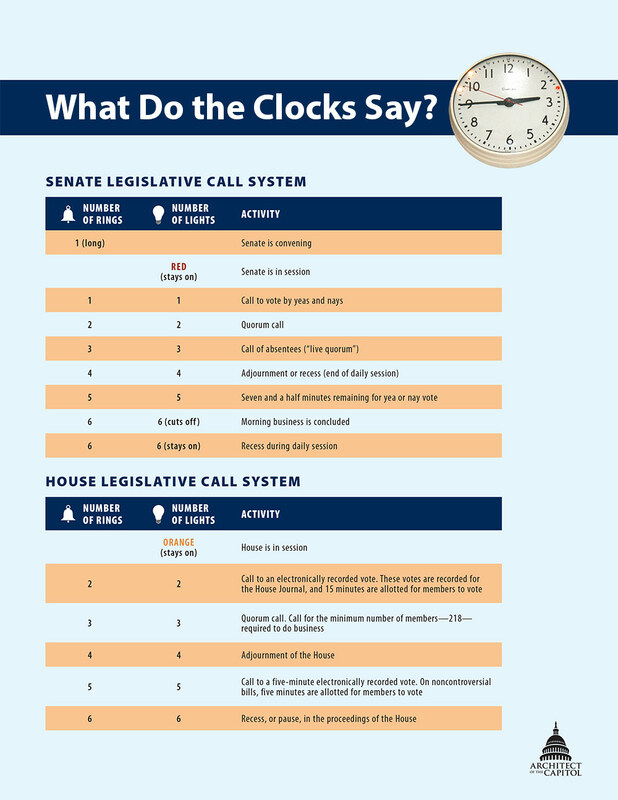 The new system went online about five years ago after the Electronic Engineering Division replaced, modified or retrofitted all of the clocks in the House and Senate office buildings and the Capitol. David Cho, AOC Electronic Engineer, was instrumental in designing the new system while Bean assisted with its implementation and installation. Parliamentarians now use tablets on the floor of the House and Senate to make the selections that send out the signals for votes and other actions. These tablets are also linked to the countdown timers in the tunnels from the House and Senate office buildings which inform members of how much time they have to get to the floor to vote. Two other famous clocks grace the Capitol. The eleven-foot-tall Voigt clock (also known as the "Ohio clock") outside of the Senate Chamber is so famous that the busy corridor where it's located is unofficially known as the Ohio clock corridor. Ordered in 1815 from Philadelphia clockmaker Thomas Voigt, the stately clock is adorned with a shield containing 17 stars and 17 stripes, which could be where its nickname came from. (Ohio was the 17th state, but was admitted to the union in 1803, well before the clock was ordered.) However, the Senate has original correspondence placing the order for the clock, and there is no connection made to Ohio's statehood. Since the clock's arrival in 1816, it has stood in or near the Senate Chamber. The Voigt clock also known as the "Ohio clock." During the lapse in federal appropriations last October, staff who wind the Voigt clock were furloughed. It was the stopped Voigt clock that provided one of the most profound symbols of the shutdown. Another famous clock in the Capitol, made by Simon Willard, is the large wall clock in the Old Supreme Court Chamber. Delivered to the Supreme Court Chamber in the Capitol in 1837, it has always maintained its association with the Court even though it's been moved several times. According to the Senate Curator's office, it strikes the hour one minute early, and there have been various stories about adjustments to its timekeeping over the years. These two clocks and others on the Senate side of the Capitol are maintained by the Office of the Senate Curator. Like at the Architect of the Capitol, staff in that office get calls when the clocks aren't running properly. "People look at the clocks for the time, because this is a working seat of government," said Deborah Wood, Collections Manager in the Office of the Senate Curator. "It would be confusing to run these clocks and not have them reflect the correct time of day. That is part of the reason we maintain them meticulously." So, the next time you're in the Main Reading Room at the Jefferson Building or in National Statuary Hall, take a moment to look up from your cell phone to check the time of day – on a clock wound by hand every Monday by AOC employees.